Berthe Morisot (1841–1895), La blanchisseuse ou femme étendant du linge (Woman Hanging Out the Washing) (c 1881), oil, dimensions and location not known. Wikimedia Commons. 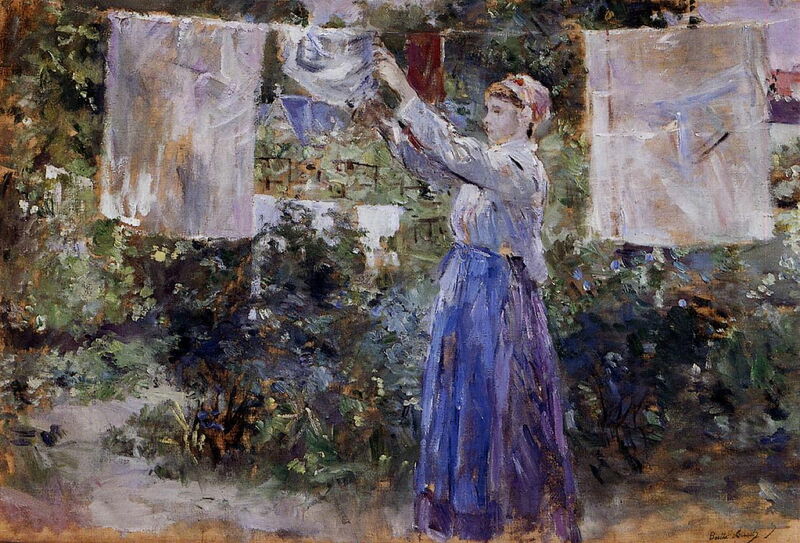 In the first article, I looked at paintings of laundering and laundresses/washerwomen in the landscape, showing that this everyday activity has been included in paintings for a long period, and that the late nineteenth century was no exception. Gabriël Metsu (1629–1667), Washerwoman (c 1650), oil on panel, 23.9 × 21 cm, Muzeum Narodowe w Warszawie, Warsaw, Poland. Wikimedia Commons. 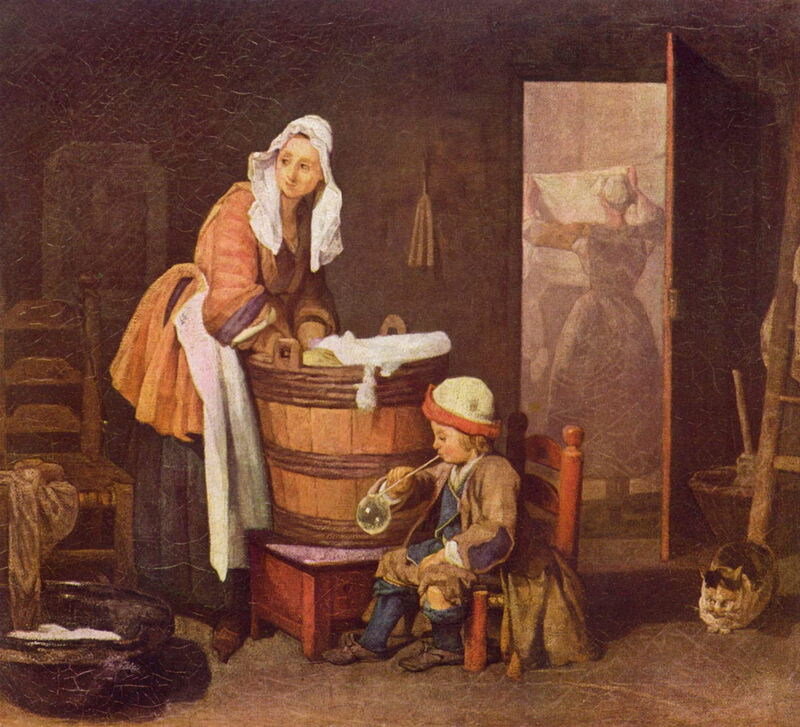 Portraits of women washing linen first became popular in Dutch and Flemish ‘cabinet’ paintings, such as Gabriël Metsu’s Washerwoman (c 1650), along with other scenes of household and similar activities. This painting appears authentic and almost socially realist: the young woman appears to be a servant, dressed in her working clothes, with only her forearms bare, and her head covered. She is in the dark and dingy lower levels of the house, and hanging up by her tub is a large earthenware vessel used to draw water. She looks tired, her eyes staring blankly at the viewer. Her expression is neutral, without any sign of a smile. Jean-Baptiste-Siméon Chardin (1699–1779), Laundress (c 1735), oil on canvas, 37 × 42 cm, Hermitage Museum Государственный Эрмитаж, Saint Petersburg, Russia. Wikimedia Commons. Although now much better-known for his still lifes, Jean-Baptiste-Siméon Chardin’s Laundress (c 1735) is one of his many fine genre paintings. This shows a more humorous view of life ‘below stairs’ in a contemporary household. A woman has her voluminous sleeves rolled up and her head well-covered as she launders in a large wooden tub. She looks off to the left of the painting, with a wry smile on her lips. In front of her, a small child in tatty clothing is blowing a large bubble from a straw, perhaps using some of the soapy water from the washing tub. At the right is one of the cats, looking as inscrutable as ever. Through a partly-open door, a maid is seen hanging clean washing up on an indoor line. Giacomo Ceruti (1698–1767), The Laundress (c 1736), oil on canvas, 145 x 130 cm, Pinacoteca Tosio Martinengo, Brescia, Italy. Wikimedia Commons. Giacomo Ceruti made his reputation for painting the poor of Brescia, in Italy, and The Laundress (c 1736) probably shows a scene from that city in Lombardy. 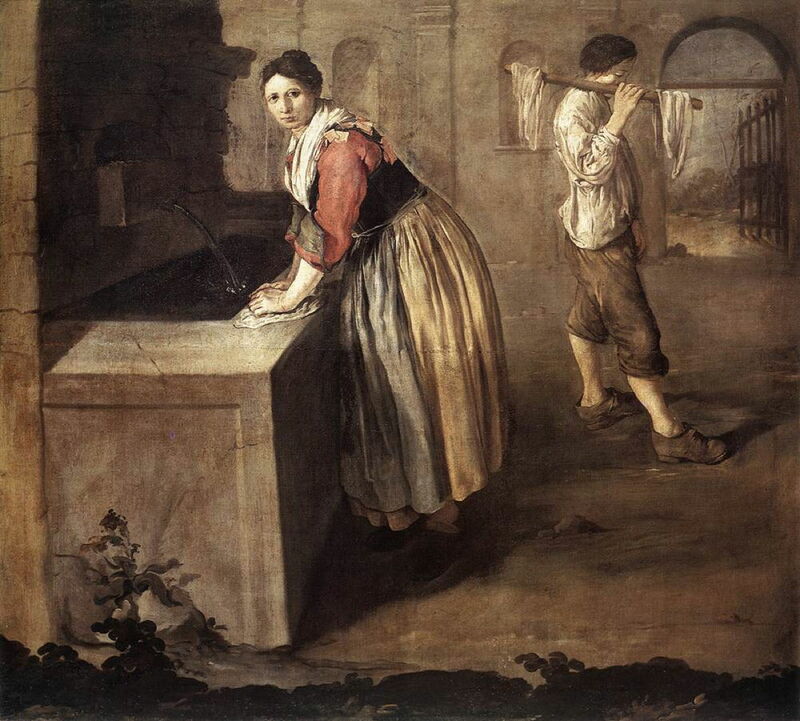 A middle-aged woman, wearing ragged working clothes, is laundering at a communal fountain. She fixes the viewer in her steely glare for a moment, as a ragged youth stands behind, holding a stick over his shoulder with more washing on it. Jean-Baptiste Greuze (1725-1805), The Laundress (1761), oil on canvas, 40.6 x 32.7 cm, The J. Paul Getty Museum, Los Angeles, CA. Wikimedia Commons. 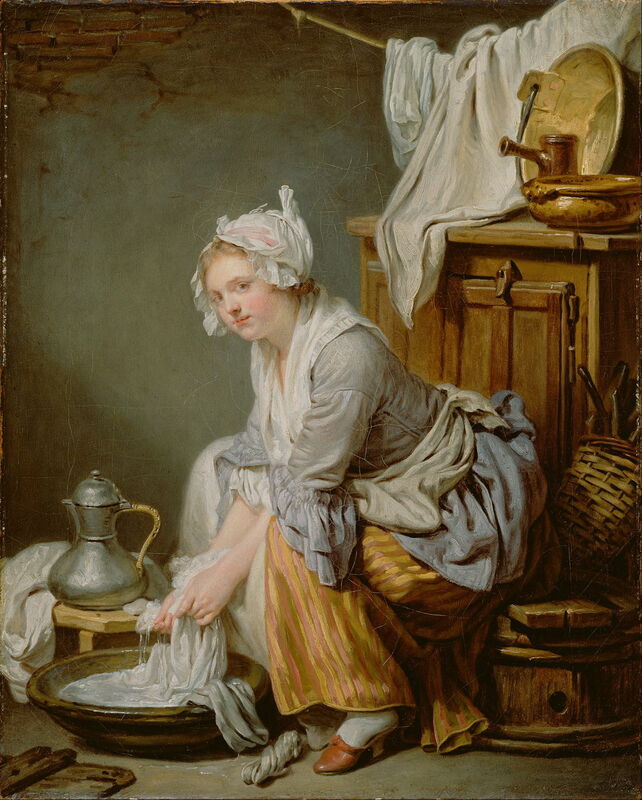 Against those, Jean-Baptiste Greuze’s The Laundress (1761) is something of a surprise. The young maid appears quite well-dressed but rather unkempt, and in clothes which don’t seem particularly intended for household work. She leans forward over a large earthenware bowl, washing smaller linen items in its soapy water. She also looks at the viewer, a slight flirting smile on her face. Her left foot is in full view. Behind the bowl is a marabout, used for boiling water. Behind her is a large wooden cupboard, above which linen is drying on a line. Greuze drops subtle hints that this young woman is provocative and flirtaceous, but hardly writes her off as a complete floozie. This was painted for Greuze’s patron, Ange-Laurent de La Live de Jully, when the artist was enjoying great success at the Salon. His reputation faded after 1780, and he lost everything in the French Revolution, dying a pauper. Jules Breton (1827–1906), Washerwoman in Brittany (1865), oil on canvas, 36.8 × 29.2 cm, Private collection. Wikimedia Commons. 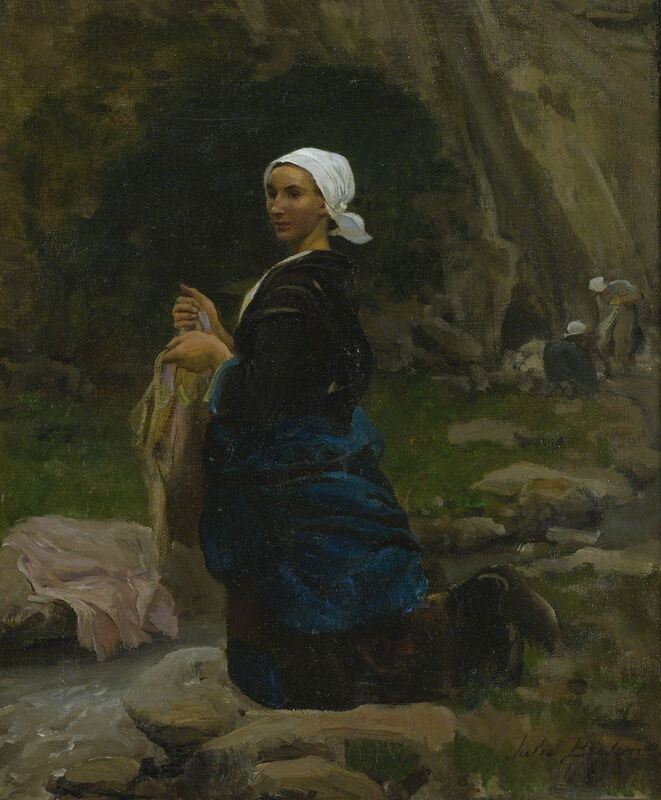 When Jules Breton started painting in Brittany, one of his early works there was his Washerwoman in Brittany (1865), which retains social realism. Her modest dress, with head covered, and her kneeling stance, are the antithesis of Greuze’s young woman. 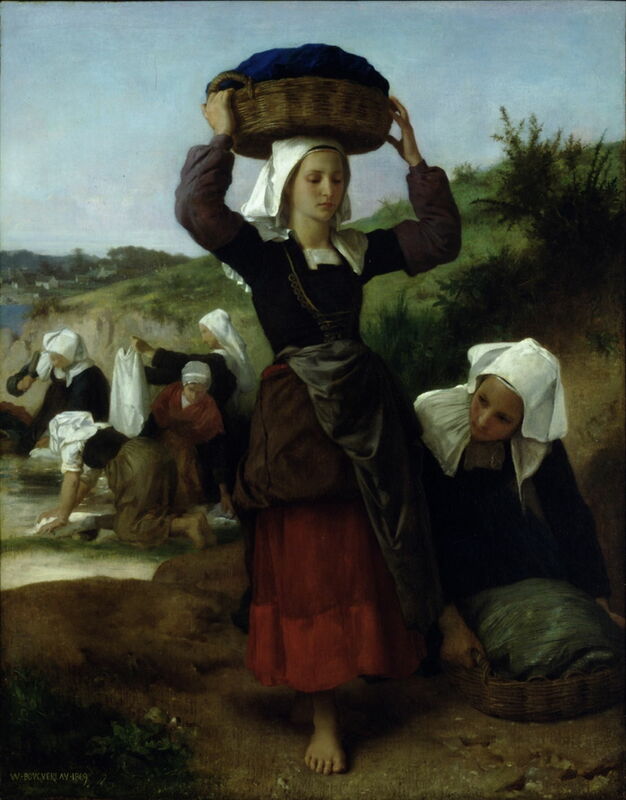 Infamous, perhaps, for his later smooth Salon nudes, William-Adolphe Bouguereau also travelled to Brittany to paint his Washerwomen of Fouesnant (1869), on the coast to the south of Quimper. The two young women in the foreground are undoubtedly pretty, but they are properly dressed, with heads covered, and only their feet bared to the view. The older women behind are also clearly hard at work. 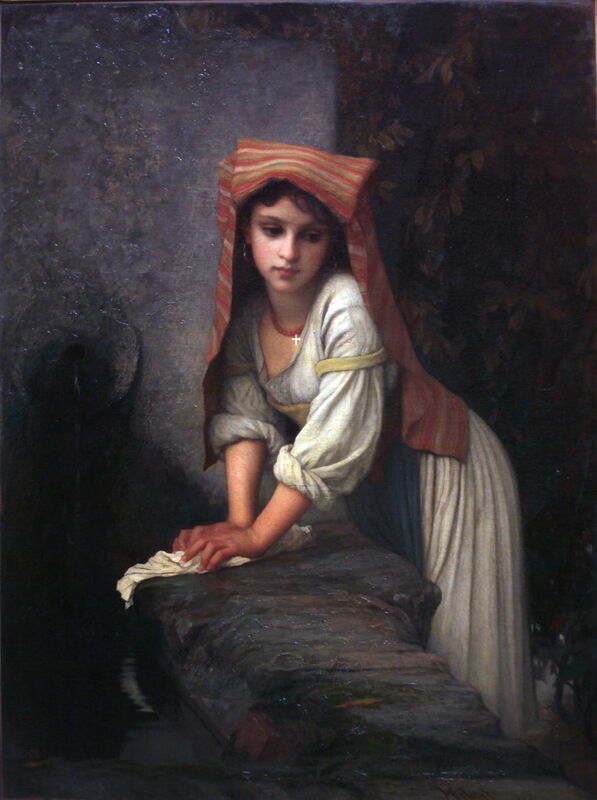 Ernest Hébert (1817–1908), Young Washerwoman Pondering (1869), oil on canvas, dimensions not known, Musée d’Orsay, Paris. Wikimedia Commons. Ernest Hébert’s Young Washerwoman Pondering (1869) has a more oriental look about her, her head-dress, and the scene around her, although there is a crucifix and a rosary around her neck. She looks as if she might have an untold story, as she rubs the washing against the stone. 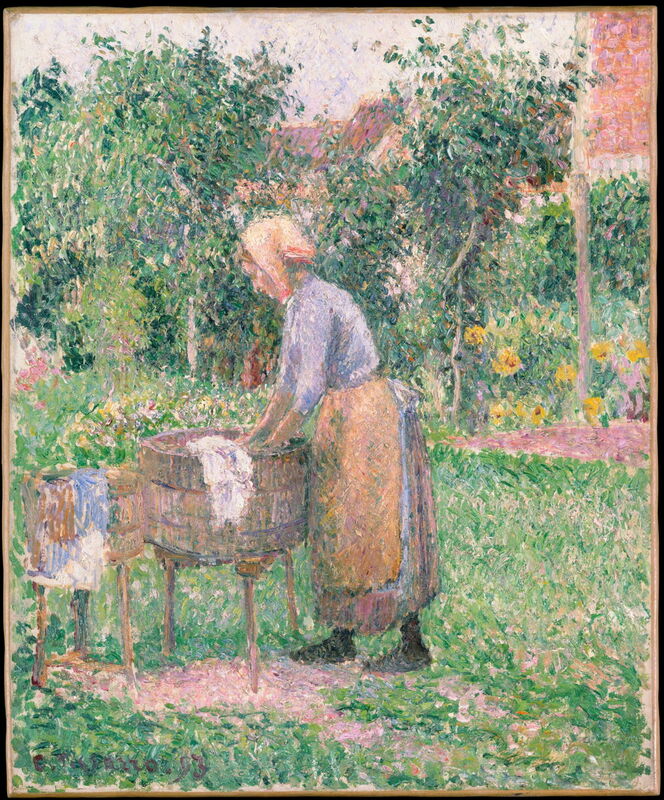 Camille Pissarro (1830–1903), Washerwoman, Study (1880), oil on canvas, 73 × 59.1 cm, Metropolitan Museum of Art, New York, NY. Wikimedia Commons. 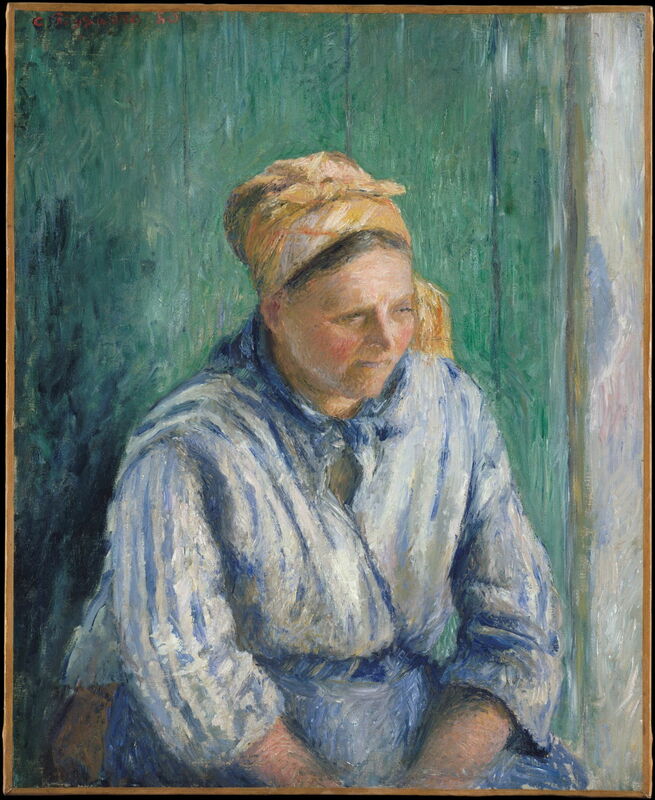 Camille Pissarro’s study of a Washerwoman (1880) is a wonderful portrait sketch of a more mature woman who has clearly worked hard on many washing days. In keeping with these thoroughly respectable and empathetic portraits is Berthe Morisot’s La blanchisseuse ou femme étendant du linge (Woman Hanging Out the Washing) (c 1881). Charles Courtney Curran (1861–1942), A Breezy Day (1887), oil on canvas, 30.3 x 50.8 cm, Pennsylvania Academy of the Fine Arts, Philadelphia, PA. Wikimedia Commons. Early in his career, the American painter Charles Courtney Curran made a series of works described on Wikipedia as featuring “young attractive working class women engaged in a variety of tasks”. 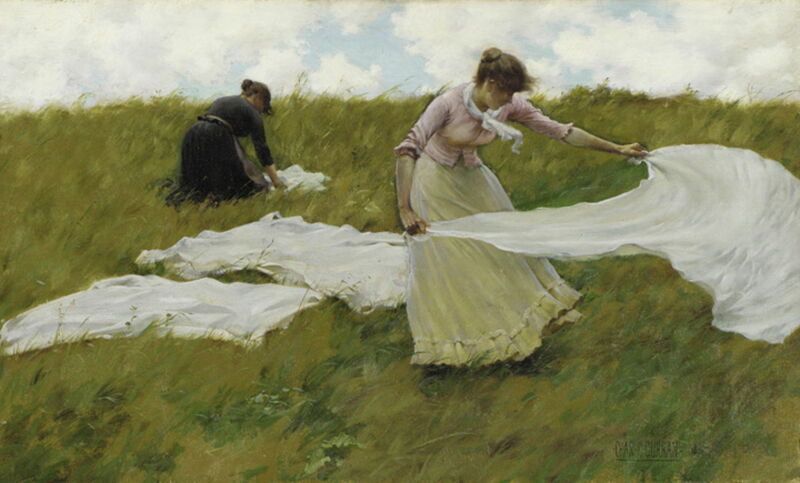 Despite that innuendo, the most successful, A Breezy Day (1887) which won the Third Hallgarten Prize for Oils from the National Academy of Design the following year, is hardly a work of licentiousness, and reminds me of some of Andrew Wyeth’s paintings. Camille Pissarro (1830–1903), A Washerwoman at Éragny (1893), oil on canvas, 45.7 x 38.1 cm, The Metropolitan Museum of Art (Gift of Mr. and Mrs. Richard Rodgers, 1964), New York, NY. Courtesy of The Metropolitan Museum of Art. My final example is one of Camille Pissarro’s huge series of paintings which he made at Éragny, this one quite late in his career: A Washerwoman at Éragny (1893). Still labouring at the same large wooden tub, just as Metsu’s maid did nearly 250 years before, she wears working clothes and has her head covered. 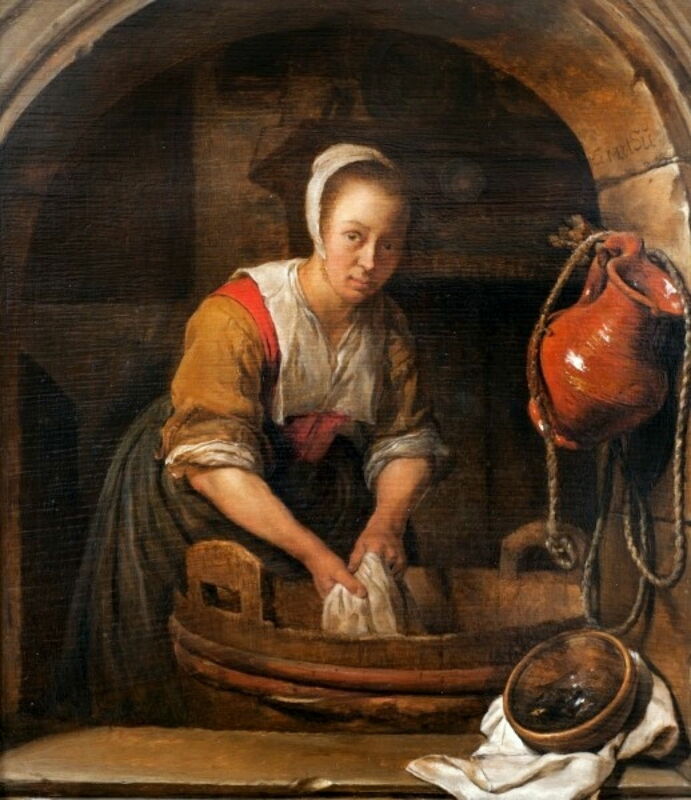 A woman’s work is never done, but many portraits of women toiling at the washing are thoroughly demure, sober, and without the slightest innuendo. There is nothing inherently sensual or sexual about such paintings – it is up to the artist to determine how they should be read. Almost without exception, laundry was an activity which was undertaken by women, something which was a matter of fact, not a statement about gender roles or any inherent misogyny on the part of the artist. Posted in General, Life, Painting and tagged Bouguereau, Breton, Ceruti, Chardin, Curran, figures, Greuze, Hébert, Metsu, Morisot, painting, Pissarro. Bookmark the permalink.